What is a 'Private Blockchain'? Private Blockchains are permissioned decentralized networks, only accessible through a license or with meeting certain credentials. The governance structure is central and they make use of the KYC standard. The key advantage of a private Blockchains is its strong and clear governance. The central governance structure makes decision-making processes and changes much easier as only one central provider is eligible. Moreover, private Blockchains are faster than e.g. public Blockchains. Nevertheless, this centralized factor makes them less secure because attacks can be organized against one provider. Due to the lack of decentralization, some people even deny that private Blockchains can be considered as “real” Blockchains. 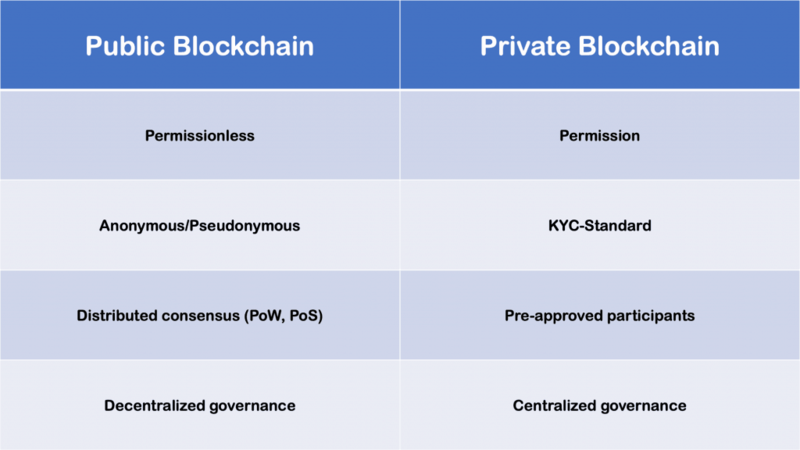 This Infographic gives you a quick overview of the key differences between public and private Blockchains.